And now it occurs to me that a year of NES games might, perhaps, be a more difficult endeavor than I had at first imagined. 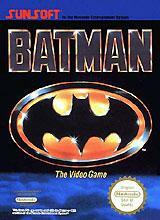 Batman was released for the NES in 1989 by Sunsoft as a movie tie-in for the first Tim Burton film. Sunsoft was known for releasing a lot of very odd licensed games in its heyday on the NES. They were very good at securing the video game rights to popular movies, yet not very good at doing anything worthwhile with them. Batman is exemplary: a mediocre game with only the loosest association to the license it's based on. Batman is a generic platformer of the type that thrived on the NES. It's odd to think that at one point platformers were the norm for video games and everything else was a genre game. Platformers once roamed the shelves of the video game section of Toys 'R' Us much as the mighty buffalo once roamed the Great Plains of the American mid-west, and like the buffalo they have now been hunted to near-extinction. Well, not quite, but the point remains that fully half of my NES games are platformers, compared to about 15% of my present-generation video games. One of the more interesting things about Batman is how little it has to do with the movie it is ostensibly based on. The game has five levels. You begin on the streets of Gotham. All well and good. Then you fight through a sort of chemical factory/power plant. Well, that makes sense, the Joker's chemical plant was a major part of the film. The third level starts as a sewer, then turns into a cave. The fourth level is the Joker's giant techno-fortress. The final level is Gotham Cathedral, so at least we finish with the actual climax of the movie. The bosses are an interesting non-canonical bunch: A guy with a jetpack who flies around and shoots energy blasts, a conveyor belt machine that fires rockets, a pair of giant blocks that cirle around the room and need to be punched to death. The Electrocutioner makes an appearance at the end of the third level (surprisingly not the power plant stage). And who could forget Batman's battle with Fire Bat at the top of Gotham Cathedral before he faced The Joker? The answer, of course, is everybody, because none of these villains ever appeared in the film. The final battle with the Joker is interesting. Point for realism: He has that really long gun, and it does huge damage if he connects with a shot. Demerits: The Joker can also call down lightning bolts from the sky. At first I thought that maybe this game started life as something else, then was transformed into the Batman game at the last minute when the license was secured. As I played more, though, this seemed less likely. There's enough about the game that says "Batman" that it was probably a Batman game from start to finish; they just decided to throw in a bunch of things they thought would be cool. There's the nugget of a fun game in Batman. The graphics are nice, if a bit dark, and the music is catchy (though not from the movie). You basically wander around punching enemies until they explode. You have a selection of weapons you can switch to which use a common pool of ammunition. There's the Batarang, a rocket gun, and some sort of spinning razor blade weapon. It's nice to have a selection, but the weapons aren't really different enough to justify their existence and you'll find yourself using the Batarang nearly every time you're not punching. You also have the ability to spring off of walls in midair, which is pretty well implemented. Controls are fairly responsive and you'll seldom find yourself blaming crappy controls for your death. The trouble is that Batman is very half-assed. There are five levels that take no more than about half an hour to finish. The game isn't so much challenging as it is frustrating; it puts you in a lot of situations where there's no way to avoid getting hit or where you have to make blind leaps and hope that by luck the enemy at the other end of the pit/top of the shaft isn't firing just as you get there. The game also repeats itself a lot. The game designers apparently believed that if a given sequence was tricky to navigate once, it was worth forcing the player to navigate multiple times in a row. There are a lot of shafts, for example, that consist of the exact same set of enemies and gears repeated three times over to extend the length. It's a shame, because Batman is a potentially fun game marred by a rushed production. It isn't nearly long enough, the level designs are careless and haphazard, and no effort at all was put into making it fit the license. It is quite fun, though, for about the first two levels. Once the giant mutant frog men appear in the sewer, though, the game just becomes tedious. I wouldn't pay more than $3 for this game. The game does have decent music (even if they did recycle the first level music for the final level). Here's a MIDI version of the Chemical Factory music from vgmusic.com, created by Jorge D. Fuentes. This page contains a single entry by Zach published on March 5, 2007 6:26 PM. My Year of NES, Week 1: 1943 was the previous entry in this blog. Cesspool is the next entry in this blog.